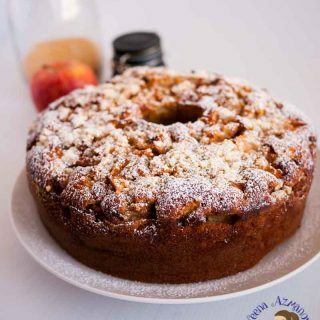 This delicious moist apple pie cake is an absolute treat in fall with juicy apple pie filling flavored with exotic spices of cinnamon, ginger, and nutmeg baked in a smooth luxurious cream cheese batter. Then topped with a crumble topping for that ultimate crisp. How has this week been treating you all? It’s been a nice cool week for us here. Not to warm in the day and pleasantly cool in the evening. Been enjoying my evening walks now in the afternoons at 3 instead of 7 pm. Feels really nice to go out at this time in the afternoon. This week was my mom in laws second death anniversary and my father in law requested me to make a simple cake for the guest. 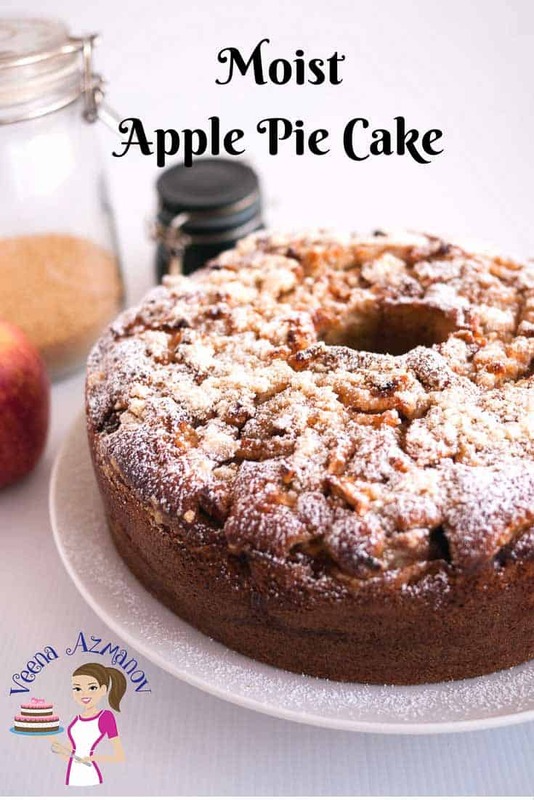 I could not think of anything other than this apple pie cake which was her favorite. The last time I made it was four years ago and she loved it so much she took the recipe from me so she could make it for her next get together with friends. I hadn’t made it since then until this week. 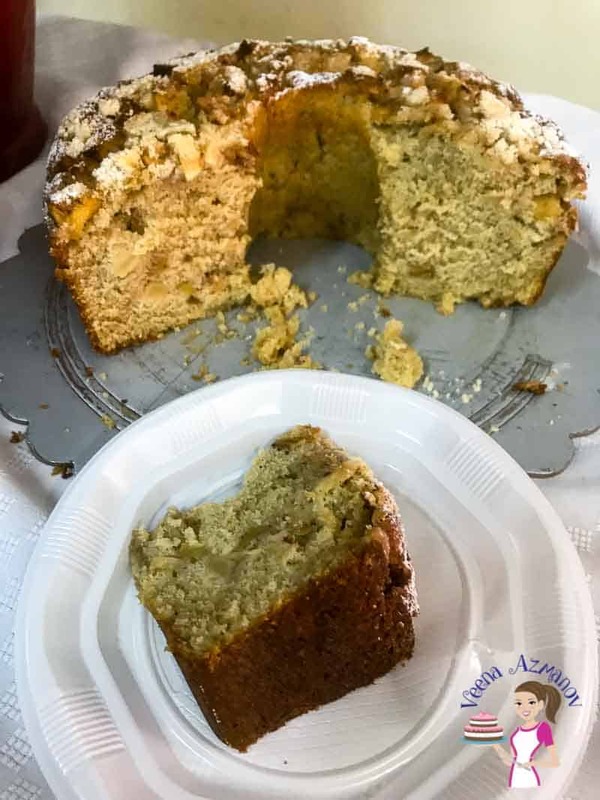 It was the same recipe and everybody loved it so much that it brought back memories of my mother in laws apple pie cake. Made me so happy. It’s amazing the connection we have with food when we feel vulnerable. You know that feeling when you feeling very emotional and need something comforting. The spices in this apple pie cake do actually help you feel all warm and cozy on the inside. The warmth of the ginger cinnamon and nutmeg really do make a huge difference in making you feel warm inside. The cake recipe is really simple easy and effortless. You do not even need any special equipment like cake mixers and stuff. A simple bowl, whisk and spatula is a good start. The mixing takes no more than 10 minutes but baking takes about an hour and is well worth it. The aroma when this cake is baking is out of this world!! I had my neighbor ask me the next day ‘what did you bake? the whole neighborhood was smelling of apple pie. Yup! It does smell like apple pie and you will love it. Apples – Today I used what I had at home. I had two gala apples, one granny smith, and two honey crisp. Ideally, I like to use a mix of apples. 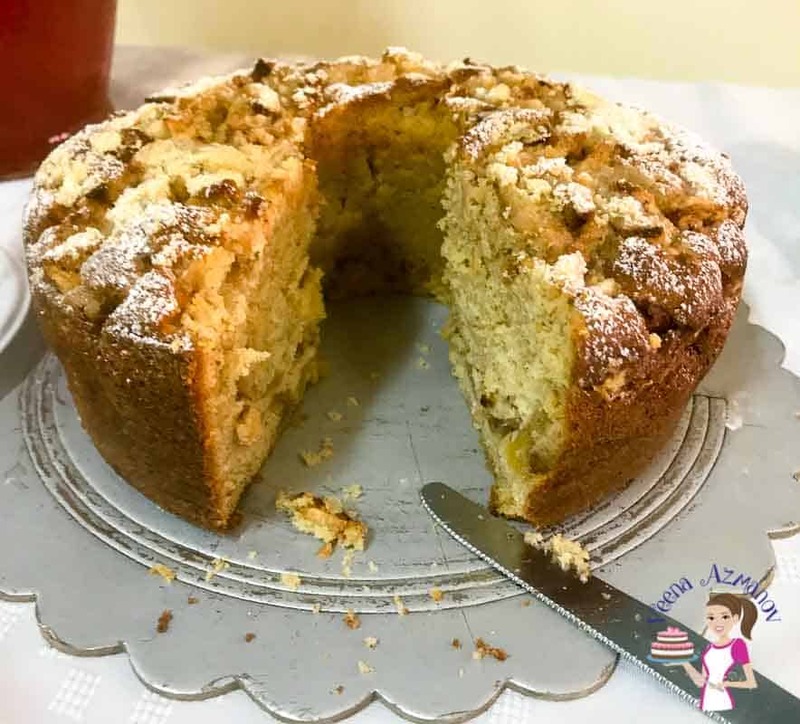 The granny smith is tart which helps offset some of the sugar but it also holds its shapes well which means you get pieces of apple that haven’t disappeared in the cake. 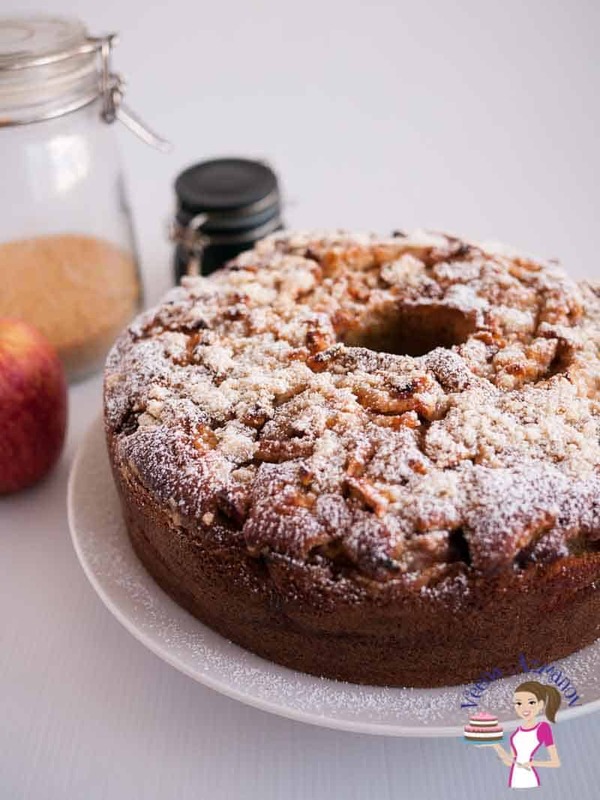 The honey crisp and gala soften and add moisture, sweetness, and texture to the cake. Honestly, no matter what apples I use this cake always turns out delicious. Cream Cheese – This is the secret to keeping this cake moist. The cream cheese not only adds a nice flavor but also makes the cake creamy and light. Spices – Is there anything better than the combination of apples and cinnamon? I think not!! Nutmeg and ground ginger add a good zing too. If you prefer you can use pumpkin spice or gingerbread spice as an alternate. And if you ever have garam masala on hand…. try it!! The bend of spices in garam masala are truly warm and wonderful in fall. Crumble Topping– Well you can omit the crumble topping but seriously don’t !! It adds that extra edge to the apple pie filling on top and absorbs all the extra juices too! Peel core and chop the apple into small pieces. Place in a bowl; add brown sugar, cornstarch, and spices. Crumble with your hands till you reach breadcrumb consistency. Add baking powder, soda, salt and spices to the flour – mix or sift – set aside. Add brown sugar and continue to cream until light and fluffy. Baking for 50 to 60 minutes until a skewer inserted in the center comes out clean. This delicious moist apple pie cake is an absolute treat in fall with juicy apple pie filling flavored with exotic spices of cinnamon, ginger, and nutmeg baked in a smooth creamy cheesecake batter. Then topped with a crumble topping for that ultimate crisp. Add baking powder, soda, salt and spices to the flour - mix or sift - set aside. Can you give me US measurements for the cream cheese, flour, and apples (cups)? Thank you! hey Keeney. The US measurements are also there. If you switch between Metrics and US customary – the US customary has the US measurements. You can even change the amount servings and personalize the recipe. Let me know if it works. I was able to switch over the measurements, thank you! One last question; recipe calls for 5 large apples, about how many cups is that? My apple tree produces apples that are slightly smaller than the large ones you find in the grocery. Would 1 of your large apples equal about 1 cup? Hey Lisa. I would think 5 cups would be a good measure. I usually use medium-large apples and that comes to about 1 cup each apple. Hope this helps. This looks delicious. I love a good fruity cake and the crumb topping makes it really special! Thanks Helen- I love cakes with fruits too. I know what you mean Sues. I’m often afraid of that too! What a lovely cake! I love the crumble topping. I need to try this recipe soon! Thank you Kathryn. The crumble is my favorite part too! What a lovely family story! Isn’t it wonderful the way a food can just remind us of a person we love. And now you have me intrigued – I will have to try garam masala with apples. I love stretching my notion of what goes with what! Absolutely Anne. Always a great feeling when you have family and food connected. Oh garam masala works great in cookies and desserts. I LOVE pie cakes!! And this one looks so delish! Perfect for the holiday season where I allow myself to eat whatever I want! LOL! Thanks for a fabulous recipe! Me too Amanda. I love the holidays as I get to indulge a bit more than usual. Ha!! This cake sounds so amazing! specially crumble topping,yum yum! I can eat this all day! Hello, if I want to make this cake a day in advance, how should it be stored? Thank you! yes, Sara you can definitely make it a day in advance. Like most cakes just store it at room temperature, Cover to prevent it from drying and once cut warp in cling wrap to prevent it from drying out as well. My mouth is watering! This looks so moist and delicious. Leave off the crumb topping no way. I can see myself eating this for breakfast with a cup of coffee. Absolutely Arlene. I love the crumb topping too. My favorite part. I loved the story!! 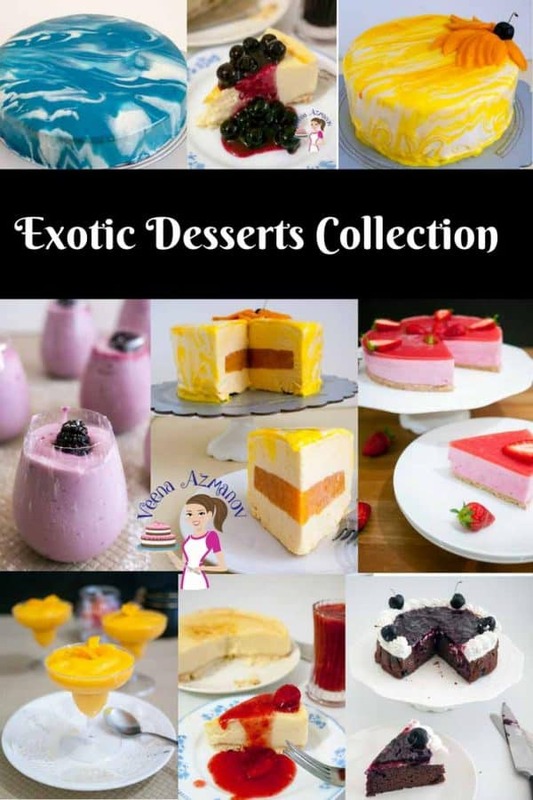 Yes, indeed food does evoke memories and most of the time they are sweet memories. I love my MIL too. She was a sweetheart! Your cake sounds delicious and the simple crumble topping is ideal on this cake. And apple pie spice is one of my favorites. You know, I’ve stopped wearing perfume because i’ve become very sensitive to smells. To me, most perfumes are too heavy. I like the natural scents and aromas of spices and food. Great recipe. Thank you Marisa. I have to be very careful with my perfumes too. I tend to get a headache with strong smells. Someone aroma of food never ever bothers me. This one smells heavenly. This cake looks SO delicious! I bet it really is THE BEST! 🙂 Can’t wait to try it! Thanks Jenni. It was absolutely delicious. I am totally with you when you say it is amazing how we re connected to food emotionally! Food for me is so much more than just food or a way to satisfy hunger… I feel food is a way to bring everyone together and such a big gateway to memories! As always your cake recipes are amazing and I love the ease of making this! I love that you don’t have to drag out the big mixer for this cake. I love just about every cake but this looks perfect for fall and especially if you have company. Can’t wait to give it a try. I think my father in law would love it! Yeah I’m lazy to use my mixer sometimes too!! Just all that washing gets to me. I hope he likes it. 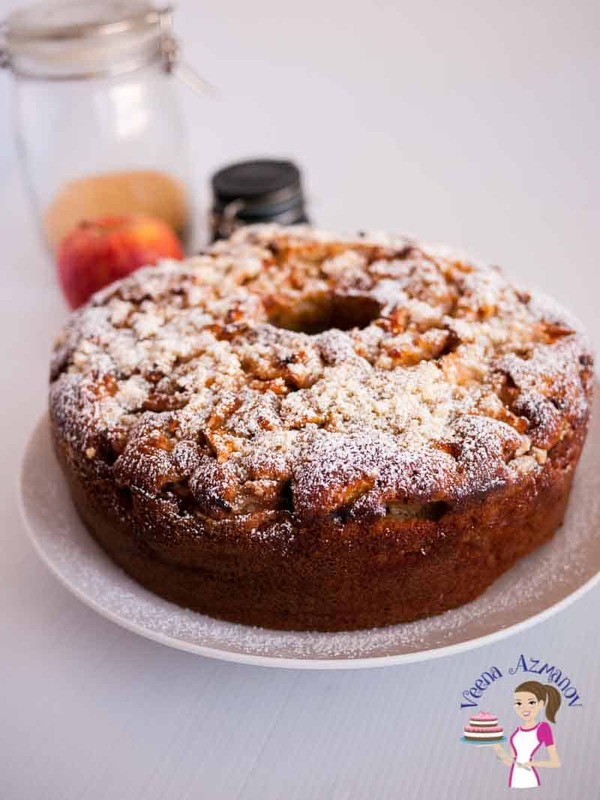 My mother had an apple cake recipe that was her favorite, too. It was very different than this, but it was very good, too. It’s true how certain foods can connect you to your feelings. This cake sounds amazing, and I can’t wait to try it. I’m enjoying the cooler days because I can do more baking. I look forward to trying this recipe. Thank you Patti. It really is amazing how we are emotionally connected to food. Oh how I wuld love a slice of this with my after dinner cup of tea! Apple anything is a winner in my book! Pinned. Yup… apple anything is a winner for me too ! I love apple desserts. OH wow, this apple pie cake looks so moist! And the crumble topping? That’s the key to my heart. I need to make this cake this Fall! I love crumble topping to! In fact I always make extra than the recipe calls for. Loving the sounds of this wonderful cake. That topping is so delicious. I would eat this for breakfast…in fact this would make a wonderful brunch item for the weekend. Easy no fuss baking wins for me. Absolutely Gloria. I love apple pie for breakfast too so this would be perfect as well. Waking up to the aroma of apples and spices..would be heavenly.